The story of a surprise brain tumor diagnosis Symptoms and Diagnosis Three years ago I was giving a slide presentation which included some pictures from my time volunteering in Africa. 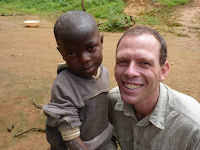 There were pictures of some of the disadvantaged and malnourished HIV orphan kids I worked with in the highlands of Ethiopia and Cameroon. I suddenly felt uncontrollably emotional. Bit odd I thought, must be getting older, or maybe the effect of now being a real family man with kids? I skipped the next section of those slides, took and breath and continued on with the show. One year ago I went to unclip my foot from the pedals of my mountain bike on a difficult section of the sidle track along the Port Hills. I couldn’t get the little ankle action quite right on the left foot and promptly toppled over. My good friend Nic and I diagnosed rusty pedal cleats and I carried on with the ride with a bit of a bruise on my hip. From Elodie on behalf of Richard. Richard's surgeon just let me know the operation went well. Four and a half hours. Richard is now in recovery and I will see him in an hour or so. They took most of the tumor out as was planned (they couldn't take out the attachment to the meninge as it is too close to the big vein but they were able to cauterise it) which makes it a grade 2 (for the doctors out there), and for the non doctors, it is as good a result as you can get! And a very good prognosis. Anyway, RIchard is now in recovery moving all 4 limbs. Lower limbs are slow but that is expected after the surgery as the brain reexpands (the surgeon also said Richard's brain was well compressed and edematous). Richard should recuperate most of his lower limbs motricity within the next 48 hours to be back where he was before surgery. “Five millimeters by five millimeters, that’s not too big” I said. “No, that’s centimeters” replied the neurosurgeon. I was a about to retort that surely neurosurgeons should talk in smaller units than centimeters… but then thought twice about criticising the guy who was going to be rummaging around in my brain in a few days time. 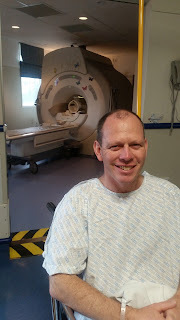 I’d been having some odd little symptoms down my left side, like catching my left ski while turning in fresh powder, so instead of an extra ski lesson, I got an MRI scan. A big humming machine and glowing computer monitors. To cut a long story short, we were sort of expecting maybe a very early stage degenerative diagnoses like motor neuron disease or MS. So I was focused on practicing my best Stephen Hawking impersonation.